Washington (CNN)A federal appeals court Thursday upheld a ruling blocking the Trump administration from ending the Obama-era program that protects young undocumented immigrants who came to the United States as children from being deported. "We conclude that plaintiffs are likely to succeed on their claim that the rescission of DACA -- at least as justified on this record -- is arbitrary, capricious, or otherwise not in accordance with law," the court ruled. Children of undocumented immigrants known as Dreamers prevailed in the first U.S. appeals court showdown over the Trump administration’s move to do away with the Obama-era program. 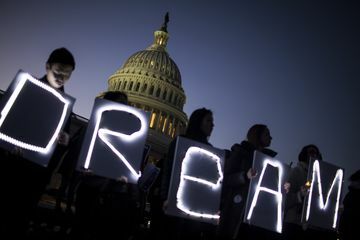 The ruling Thursday upholds one of four lower-court rulings barring the government from ending Deferred Action for Childhood Arrivals, or DACA, which allows about 700,000 people to legally live, study and work in the U.S. and protects them from deportation. President Donald Trump and Congress remain in a stalemate over whether to preserve, modify or phase out the program. The Trump administration unveiled its plan for an “orderly wind-down” of DACA in September 2017. Since then, relations between the White House and Democrats have further soured and the DACA debate was overshadowed by controversy over the president’s “zero tolerance” border crossing crackdown that led to thousands of migrant parents and children being separated in detention. There was little incentive for a political solution before November’s mid-term elections because there was no immediate threat of DACA beneficiaries being deported. The Justice Department didn’t immediately respond to a request for comment on the ruling. Trump’s best chance for escalating the fight to the U.S. Supreme courtmay lie with a case filed this year with a federal judge in a Texas border town who previously shut down a related Obama administration immigrant-protection program. While the judge in Brownsville, Texas, in August declined a request by the state of Texas and other Republican-led states to immediately halt DACA, he said the states will probably succeed in proving the program was launched unlawfully in 2012 without congressional approval. A mix of conflicting rulings would increase the odds the nation’s highest court will step in to resolve the dispute. Separate appeals courts are reviewing rulings by judges in Brooklyn, New York, and Washington that halted Trump’s effort to rescind DACA. U.S. District Judge William Alsup in San Francisco was the first jurist to rule on the president’s directive to phase out DACA in March 2018. In his January ruling, Alsup rejected the government’s argument that the courts can’t review whether the president improperly decided to terminate the program. Alsup ruled that the government need not process new DACA applications and was free to deport Dreamers found to pose a national security or public safety threat. But he did require federal officials to honor prior DACA approvals and to process renewal applications while the court fight continued. Last edited by GeorgiaPeach; 11-08-2018 at 03:03 PM. This is insane. DACA is not a law. It was an executive order and to say EOs are binding on all future presidents is absurd. But the Justice Department is likely to appeal the ruling to the Supreme Court, which now has five reliably conservative justices. The high court in February refused to leap-frog the appeals court's review of Judge William Alsup's decision. Two other federal appeals courts also are reviewing the dispute between the Trump administration and the states, local governments and immigrant rights groups fighting to maintain the program. No surprise here with the 9th circuit. On to the Supreme Court. Judy, GeorgiaPeach, Beezer and 1 others like this. Obama gave illegals a card saying they can live and work here even though the law says they can't. How can that be legal? GeorgiaPeach, Beezer and Jean like this. Trump has appointed 4 judges to the 9th Circuit with 3 more pending. Such common sense but there's little of that in politics it seems.